Former astronaut Capt. Winston Scott will speak at Seminole State College Feb. 28. Scott’s appearance at Seminole State’s Sanford/Lake Mary campus on Feb. 28 will wrap up Seminole State’s lineup of Black History Month events. During his visit, Scott is expected to meet with SSC faculty in the Planetarium from 3 to 4 p.m. After dinner, the former Space Shuttle astronaut will give a keynote address in the Concert Hall at 7 p.m. followed by a book signing in the Concert Hall lobby. Jones said the goal for Black History Month is for students to understand the sacrifices that occurred in order to have this moment at Seminole State. “Someone paved the way for these movements, and something happened so we could all attend a college that is humanely diverse,” Jones explained. He added that he has high hopes many people will attend the event. Jones also said he wanted to invite Capt. Scott to the college because the former astronaut exemplifies the importance of science, technology, engineering and math education, or STEM. Scott is a native to Florida. He was born in Miami in 1950 and graduated from Florida State University with a bachelor’s of art degree in Music in 1972. He also earned a master’s of science degree in aero­nautical engineering from a U.S. Naval Postgraduate school in 1980. After finishing at Florida State, Scott had already completed training and was designated a naval avi­ator just two years after graduating. He served four years with the Helicopter Anti-Submarine Squadron (HSL-33) at a Naval Air Station in North Carolina. In 1978, Scott was chosen to attend the Naval Postgraduate School, where after earning his degree, and he went through jet training in the TA-4J Skyhawk. He served another tour of duty, this time with Fighter Squad­ron Eighty Four (VF-84) in NAS Oceana, Virginia. In 1986, he became an aero­space engineering duty officer, and he also served as a pro­duction test pilot at the Naval Aviation Depot in Jacksonville. Scott has more than 5,000 hours of flight on record, aboard about 20 different military and civilian aircraft. Then in 1992, NASA informed Scott that the agen­cy wanted him for astronaut training. He served as a mission specialist on the STS-72 Endeavour in 1996, which was a nine-day flight that had the crew retrieve the Space Flyer Unit satellite that was launched from Japan, and deploy and retrieve the OAST-Flyer satellite. On that mission, Scott conducted one spacewalk to demonstrate and evaluating techniques which were later used to assemble the International Space Station. His next big mission was the following year, where he served on the STS-87 Columbia. It was a 16-day flight from Nov. 19 to Dec. 5. During this mission, Captain Scott conducted two separate spacewalks. The first lasted more than seven hours and required him to retrieve the Spartan satellite by hand. The second had Scott further testing tools and measures for the space station assembly. 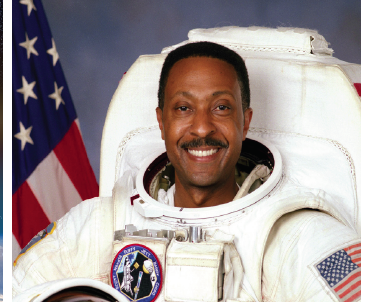 After two successful missions, Scott retired in 1999, and began working at Florida State University as the vice president for Student Affairs and associate dean. In 2003, he became the executive director for the FSA, an organization accountable for the expansion of space-related business in Florida. Then in 2006, Captain Scott became vice president and deputy general manager at Johnson Space Center in Houston. He’s earned many medals and awards for his time and dedication through training, and for both the Endeavour and Columbia missions. Growing up during the Civil Rights Movement, Scott witnessed many African Americans suppressed because of the color of their skin, but he overcame those obstacles to pursue his place in history.